BOM Rehab with HST bonus! 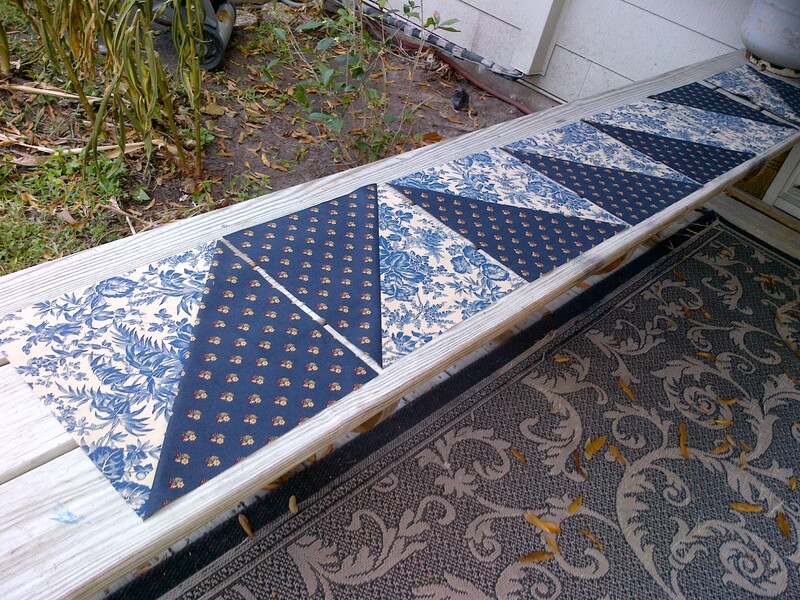 It seems that HST projects are all over my favorite blogs right now. In particular, doing blocks inspired by a post from Camille Roskelley of the Bonnie and Camille team. 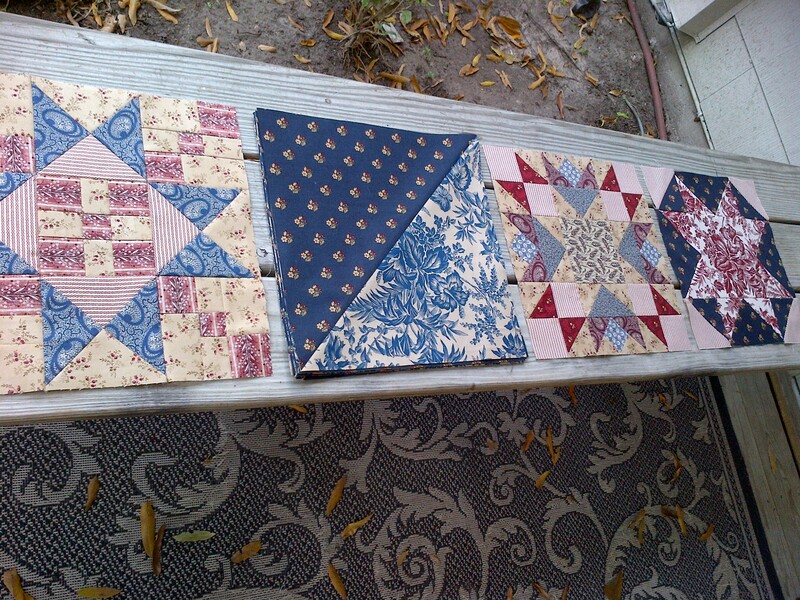 In my BOM Rehab work this week, I had the task of creating 12 block size HSTs for setting squares on the Generals’ Wives project. You may look at this and say … hey – that’s a nice block. Well, I made two mistakes doing this late at night Friday. Once I saw that I had sewn four pairs of pieces together wrong, I just ‘went with it’ and then I noticed I had my corners wrong too. 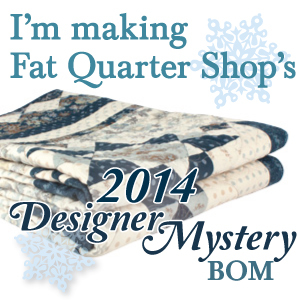 Oh well – it will be my special block to create a unique quilt top. But that isn’t the only BOM Rehab work I did! Oh no! Remember this project? Away from Home by Nancy Rink, Mill Girls fabric by Judie Rothermel. The instructions for the quilt are in this book, Away from Home, by Nancy and Oliver Rink. Only the center portrait area is shown in the book cover below. 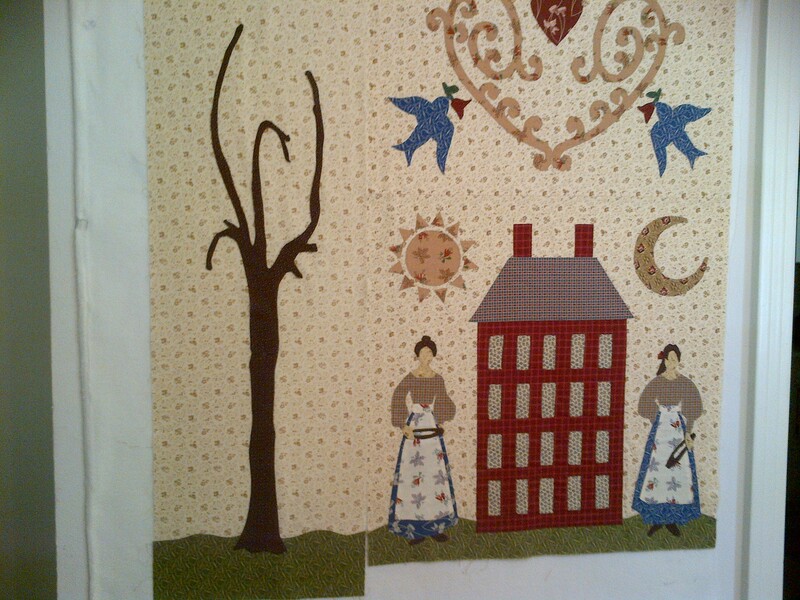 The quilt finishes around 100″ square. I had gotten through the center piece and one tree. You can click on my tag list to see all my posts for Away from Home. Once the leaves are on, I’ll join the three sections together and square it up. 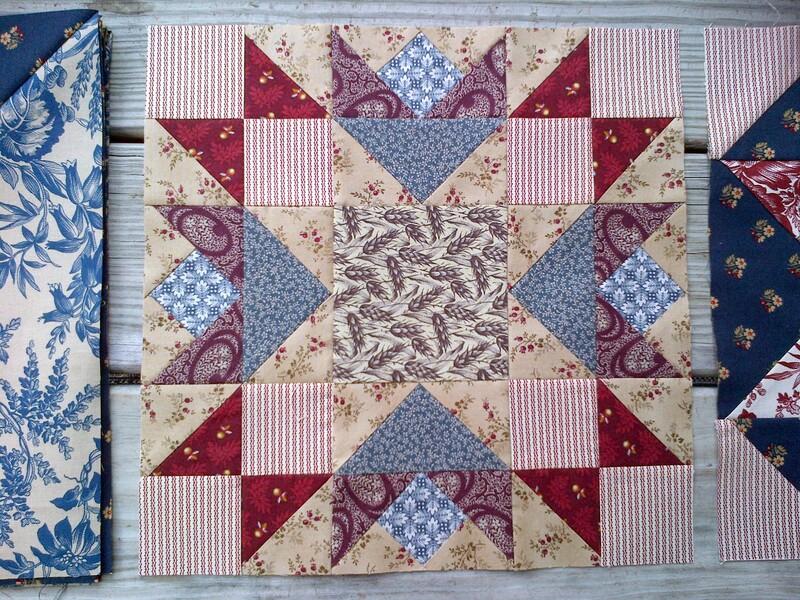 This will be followed by 20 spool blocks (easy peasy) and an inner containment border and then move to the outer pieced blocks. What other BOMs do I want to work on? The last two haven’t even started yet, but will be later this month or February. Can you tell I love BOMs? They really add to your stash too with the leftovers. Hope you all have a great week lined up. Thanks for stopping by and dropping a comment if you are so inclined! Let me know if you are working on any of the same BOMs as me! ← Loving my BOM rehab work! You have been and are going to be a very busy girl!! Have fun! Now that is an ambitious list of BOM projects! It’s going to be fun watching them unfold . 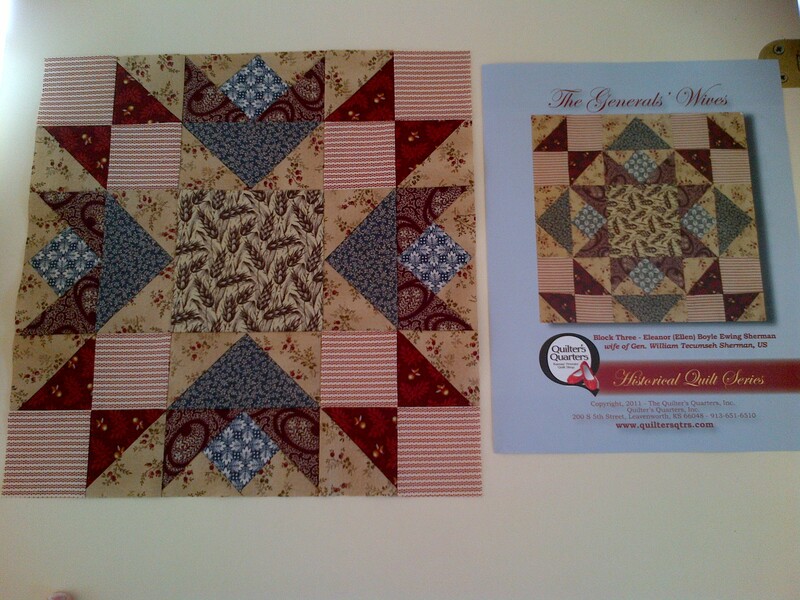 . .
I’m also doing 2013 designer block of the month by FQS. I wish I could have started Hampton ridge. 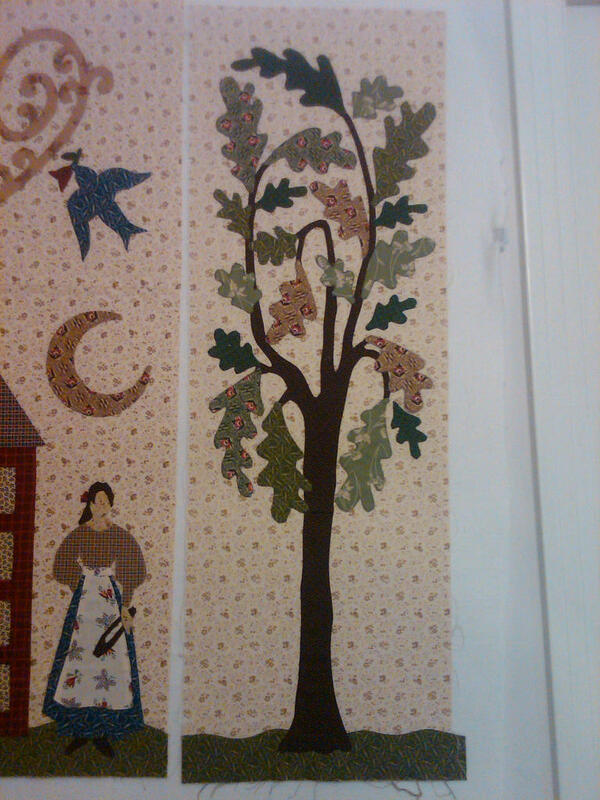 I saw this quilt in a LQS this past November and loved it! I guess I’m going to live vicariously thru you to watch all those BOM’s come together. Great job! Hi Jennifer, your work is gorgeous. The fabric is gorgeous. Amazing! I wanna come play with you! I don’t know some of the items on your list… but I bet I would like them! The blocks for the Generals Wife BOM are gorgeous. Love the designs and the colours. I’ve got an ambitious list of BOMs I’d like to do too, some the same as you. Probably won’t have time for any though.